Do you ever feel like you’ve got enough friends to keep up with? And besides, making new friends can be a little uncomfortable…awkward even. Well I’m generally a people person. I like people. I grew up in a tribe of five. I am genuinely interested in people’s stories and I like to know what makes them tick. I am blessed with a lot of friends. I love them, but I feel like I don’t get enough time with them as it is. And then there are the women I’ve connected with online and at writing and blogging conferences. Time to just settle down and enjoy the friends I have. So I kind of thought I was done making new friends. I had the pleasure of meeting Kim Hyland, the founder of the Winsome Retreat, at the Allume conference in the fall of 2014. She was so sweet in reaching out to me and encouraging me to come to her event, so I did. I didn’t know anyone who was going from my area, so I saddled up the horse…or at least put some gas in my car…and made the four-and-a-half-hour trek alone through the Pennsylvania countryside. I felt a little nervous as the sun set and darkness fell over the miles of beautiful farmland and windy roads. What will this be like? I don’t really know anyone very well. Well at least I know Delonna Gibbs. She’ll be there. Finally I found the long twisty road that led to the White Sulphur Springs Conference Center. I was weary from the ride. It was cold and dark, but the conference lodge shone like a beacon at the top of a hill. I made my way to the reception area and checked in. Of course, the woman from the retreat team couldn’t have been more welcoming. I got my room assignment. Since Kim headed up Winsome, I assumed she was in charge of room assignments and would likely put me in a room with Delonna (who Kim knew I had met at Allume as well). Oh no…I just want to relax and be reunited with my friend. I’m not up for getting to know someone new. “Dinner is about to start, so you might want to get your stuff to your room and come on back down,” she smiled. “Oh, okay, thanks. I’ll do that.” I murmured. When I got to the room, the stranger’s stuff was already there. Honestly, I felt like crying. I was looking forward to spending more time with Delonna, getting to know her better. What could Kim be thinking? The retreat was off to a wonderful start, a beautiful evening of worship and an enriching first keynote. Soon it was time for bed. I went upstairs with trepidation. I was tired and now I had to make small talk. Turned out, my roommate, Robin Hurst, was friendly and engaging…and before we knew it, we were talking, laughing, crying, sharing as if we had known each other for years. Instant friends! We even stayed up a little too late that night getting to know one another. We talked from the depths of our hearts - life stories of pain and redemption, loss and gain. We exchanged our desires, our writing, plans, hopes. Our friendship quickly developed within the course of those couple of days. Though Kim had put strangers together as roommates, it was obvious to us both that it was God who really put us together. This was a divine appointment. Soon after the Winsome Retreat, Robin experienced the heartbreak of losing her dad suddenly, I reached out to her to let her know I was thinking of her. I lost my cherished dad just years before and our conversations during our time together at the retreat revealed we both adored our dads and they adored us. This was a little cement that glued our relationship beyond that weekend. And then when Robin was looking for a writing coach/consultant to help her tie up some loose ends on her beautiful children’s book, How Can I Choose, my beloved friend and encourager extraordinaire Holley Gerth suggested me. How crazy is that? Holley had no idea Robin and I had met already. I’m so thankful God pushed me into this new friendship with Robin. I had become complacent, maybe even a little uncomfortable about stretching into new relationships. But my encounter with Robin revived my delight in meeting new people. 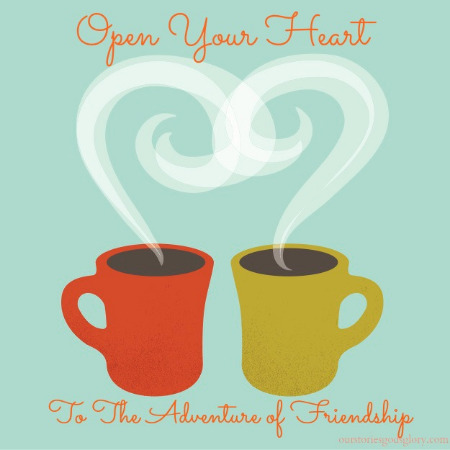 It opened up my heart…or maybe Robin opened up my heart to the adventure of new friendships. So this year in April 2015, I headed to Winsome, this time with eager expectation of the connections I would make. I trekked again to those beautiful mountains with a car full of women, two of whom started out as strangers, who, through the weekend, became my cherished new friends. I roomed with Robin again, along with my dear friend and Co-Founder of Circles of Faith Kimberly Amici. Just as I had the year before, I talked, laughed, and cried with those God brought into my life. Turns out forging new relationships is a blessed adventure that adds depth and richness to life.